This is a major threat the North Fitzroy. Such massive on an off ramps can only be justified by an order of magnitude increase in traffic volumes on Hoddle Street, a street which is already at full capacity most times of the day with 90,000 vehicles daily. The East-West Link Assessment Committtee found that the flyover could not be justified by the traffic it is required to carry, and recommended it be deleted. But the Minister ignored this advice. 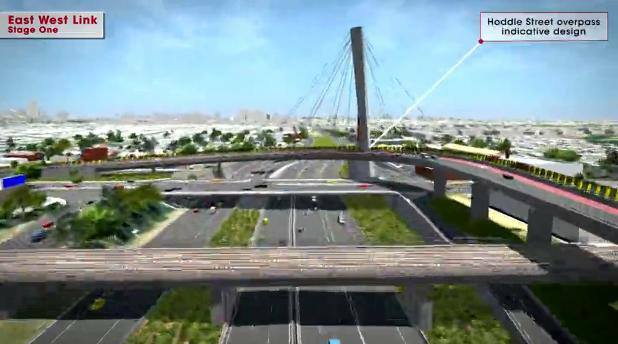 With the release of the design of the Hoddle Off-ramp July 17 2013), it appears the Hoddle Freeway is still in the bottom drawer at Vic Roads. This will realise the road lobby’s dream to connect Hoddle Street to the Hume Freeway.